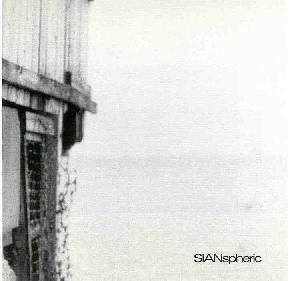 SIANspheric - "There's Always Someplace You'd Rather Be"
Hailing from Burlington in the industrial heart of Ontario, Canada, SIANspheric paints a grey landscape (just take a look at the cover) with their brand of gloomy, yet dreamy ambient/noise rock. Endeavoring to expand upon what the Verve, My Bloody Valentine, and Radiohead have started in the British isles, the trio of Sean Ramsay (Guitar), Steve Peruzzi (Bass, Vocals) and Matt Durrant (Drums) seem to have come up with enough 'variations on that theme' to warrant their existence. There's Always Someplace is their second full-length release following 1995's Somnium, which I have not heard. The eight tracks (each around 5 or 6 minutes in length) plus three uncredited bonus tracks fill up nearly an hour's worth of disc-time. After a single listen, the immense variety in dynamics, clarity, and pace was something I immediately noticed, and which I'm happy to report (it's so often missing in this genre). "I'm Feeling Better" and "Can't Get It Up" are uncharacteristically up-tempo songs, the former an 80's new wave-like romp but with the droney guitar soup in tact, the latter a modern heavy rock track (could be Bob Mould) that towards the end turns into a surprisingly original psychedelic noise-fest. "Nothing Stands" is a whole different story - a slow, subtle Floydian tune, but with crisp clarity and definition employed in its attempt at somatic inducement as opposed to the soupy drone guitar. The vocals, nearly always unintelligible, are here again soft and distant in the mix, but still constitute an additional dreamy layer to the overall sound. "Puff, Analogue, Intelligent Jungle" rounds out the titled tracks with several phases, though never departing too far from the early Verve-style of simple linear bass-playing and drums, and layered guitar lines (alternating from droney to spacey to shimmery). The bonus tracks don't add too much to the album, though the middle one has an ambient gliss-guitar feel to it that would make Daevid Allen proud. The final 10-minute piece is like just one more shoegazing Ride-style anthem - a touch of needless excess. Frankly, I'm still a little too much of a newbie to the world of 'psychedeli-dream-pop' (my made-up term) to judge accurately, but There's Always Someplace is as good as most I've heard, though in my mind it falls short of the punchier offerings by Levitation (Coterie) and 7% Solution (All About Satellites and Spaceships). But if you're one who thinks the Verve's A Storm in Heaven is truly heavenly, you'll likely find SIANspheric to be right for you. Personally, if I were making a sci-fi film and was looking for a band to record the soundtrack, I think I might turn to these guys.